E-commerce sales are projected to top $1.18 trillion a year, according to Forrester Research. And BigCommerce has its eyes set on capturing its fair share of this market by getting businesses online easily with ready-made storefronts. With its turnkey shopping cart and easy setup, it’s no wonder BigCommerce already supports around 100,000 businesses, including big names like Toyota and Sony. Most of its customers however are smaller businesses who earn between $50,000 and $400,000 a year. So you might be wondering whether BigCommerce is the right solution for your business. Or whether competitors like Shopify would better suit your needs. 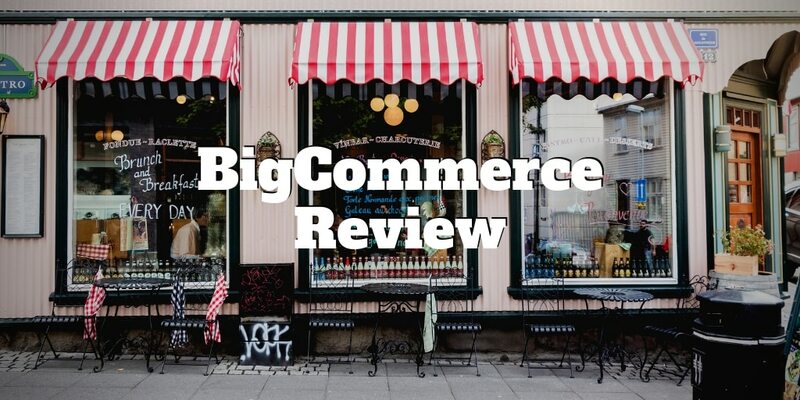 In our BigCommerce review, we cover everything you need to know to make the right decision. Is BigCommerce Right for You? If you have an offline store and want to move online, BigCommerce is your one stop shop. With BigCommerce, you can start selling products on the internet within minutes without having to know a lick of code. All you have to do is upload your product list, pick your storefront design, and you’re good to go. Ongoing tasks like inventory tracking and order management, as well as payments integration fall under the BigCommerce umbrella too. You’ll still make all the important front-end decisions regarding design, sales, and promotion, but you’ll be able to outsource back-end functionality to BigCommerce. You don’t need to be a tech whiz either. Things Google cares about to rank your page like how fast your website pages load are all taken care of by BigCommerce. That’s good news because you won’t lose potential customers who hate waiting for more than a few seconds for a website page to load. Other concerns of small business owners like the security of customer information is outsourced to BigCommerce who stores credit card information securely. A further plus is the ability to create cyberstores that are customized for mobile devices. 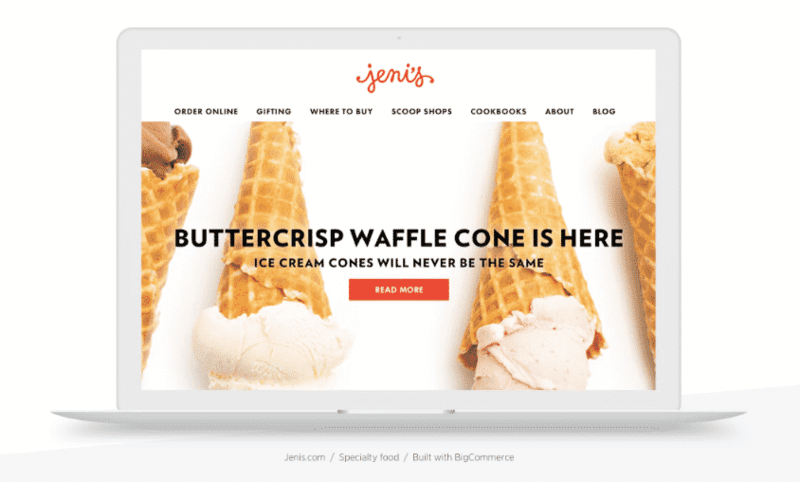 BigCommerce Next is a 2014 upgrade to the basic BigCommerce platform that allows online merchants to connect with potential customers through third-party apps. Merchants can add these functionalities to their online stores with a single click. Using the Next platform, merchants can also connect with mobile management apps to stay informed about performance metrics and inventory updates in real time. BigCommerce Next is integrated with Google Trusted Stores. Once you create an account with BigCommerce and log in to it, you’ll be taken to your control panel and prompted to set up your BigCommerce store. Simply enter information about your products, shipping options, and tax rates. That’s all the info you need to launch a bare-bones store. When your store goes live, the “Getting Started” page will be replaced by your BigCommerce dashboard. A vertical menu on the left side of your dashboard contains links to feature options. For example, when you click “Store Design,” you will be taken to a page that displays templates, themes, and styles. In addition to viewing your data, many of the dashboard menu options have an option that allows you to edit that data if you wish. E-commerce solutions are not a one-size-fits-all solution. The right e-commerce platform for your business will depend on your budget and how important features like custom design options, customer care, marketing support, and website loading speed are for you. The user interface is relatively straightforward. Nevertheless, even the simplest e-commerce technology can seem a bit daunting if you have no previous experience. Expect a learning curve if you are a first-time user just as you would with any new product or service. One of BigCommerce’s strengths is that it offers users excellent information to help successfully navigate any difficulties while building and managing their online stores. How-to guides can be accessed by clicking the “Help” option on the vertical menu to the left on the dashboard. And a help center is available with dozens of instructional videos, FAQs, and both user and developer guides. Customer service support by phone is available 24/7 in nine countries. BigCommerce is a hosted online store management system. You don’t actually buy the software to set up an internet shop; instead, you subscribe to it, which means you’ll pay a monthly fee to license its use. This saves you from having to invest in technology upfront. Partnering with a hosted service can save you money you might otherwise spend on essential IT services such as server hosting and maintenance, firewall management, mail hosting, and application hosting. 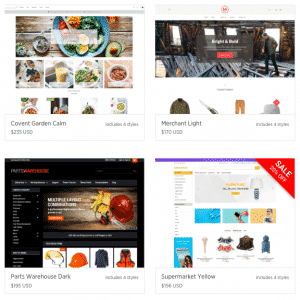 BigCommerce clients have access to 7 free themes and more than 120 premium themes. Every theme contains several different styles, so the content management system offers lots of choice. Themes have been selectively designed to optimize search results. Clients with a working knowledge of HTML, cascading style sheets, and web design can customize Stencil framework themes; this is not an option for clients who elect to use Blueprint framework themes. A number of tools are available to track inventory levels efficiently. Plus, you have complete control over setting your own shipping rates. Whether products are physical, digital, or service-based products, you have the option to add custom fields to your product descriptions or even import product SKUs from other sites and track returns easily too. Setting up product categories is a simple task; there’s a “Bulk Edit” option that accelerates the process of designating products. Within each broad category, you’ll upload individual products manually. You can create a number of options to describe products, which comes in very handy if you’re dealing with products that come in an assortment of colors, sizes, and shapes. Plus it’s easy to collect custom data from customers, such as inscriptions they might want on a piece of jewelry. Each inventory item has its own product screen. Image optimization technology is integrated right into the BigCommerce software; not only does this allow your potential customers to view the products they’re interested in purchasing right away, but your shop’s webpages will be served more quickly, which has the potential to improve your products’ search rankings. At your fingertips is an extensive marketing tool set that can be used to offer customers a customized shopping experience. BigCommerce integrates seamlessly with a number of online marketplaces, thereby enabling e-merchants to launch channels on Amazon, eBay, Pinterest, Facebook, Instagram, and even Alibaba. It is the only e-commerce platform that integrates with Google’s Merchant Center, which means products can be sold via Google Shopping. For data lovers, sophisticated metrics are offered with even the most affordably priced plan. Track where your customers came from, whether they’re new or returning customers, what products they’re searching for, and the last time that they bought something. You’ll also be able to access abandoned shopping cart reports at the Plus subscription level and higher. Prospective customers can try the platform out for free for 15 days. If you exceed annual sales limits, you will be compelled to upgrade to the next highest-priced plan. Plus is the most popular plan. Users who pay annually for the Plus and Pro plans receive a 10 percent discount. The abandoned shopping cart tool and the ability to store credit card information are only available to Plus customers and above. BigCommerce does not charge transaction fees. You will pay fees to whichever companies process the payments you elect to receive through your online store. BigCommerce offers full integration with PayPal, Amazon Pay, Stripe, Apple Pay, and other digital wallets as well as more than 60 other pre-integrated payment gateways that serve more than 100 countries. It also partners with PayPal to offer clients discounted PayPal transaction fees. BigCommerce’s biggest plus may also be its biggest minus: It’s such a comprehensive platform with so many core features that it’s easy to become overwhelmed by everything it offers. ✅ One Stop Online Store: Practically everything you need to create a compelling online store is already integrated into BigCommerce’s software. ❌ Variable Fees: The annual sales limits and forced upgrades amount to a kind of hidden fee that penalizes clients for success. ✅ No Transaction Fees: BigCommerce doesn’t charge transaction fees on any of its plans. ❌ User Experience: The visual template editor can be difficult to use. ✅ Cross Channel Storefront: BigCommerce allows you to maintain a presence on strong shopping channels like Amazon, Google Shopping, and eBay as well as on social media sites such as Facebook and Instagram. ✅ Responsive Storefront: Your storefront can be viewed online and mobile devices. ✅ Single Page Checkout: Customers can easily purchase products on your online store. BigCommerce is an out-of-the-box e-commerce solution that offers great inventory management support, sophisticated marketing tools, and the ability to sell across multiple channels. You’re interested in selling more products by offering those products across a variety of different shopping channels. In 2018, a round of funding led by Goldman Sachs raised $64 million; this brings the total amount raised by BigCommerce since it was founded in 2009 to $200 million. With strategic alliances in place with PayPal and Google, as well as eBay, Google and Alibaba integration, BigCommerce’s goal is to help its customers build their brands on multiple platforms across the globe while dramatically cutting the operating expenses associated with a large online presence. The bottom line is BigCommerce is trusted by tens of thousands of business and top tier investors globally.